Over the past year Russia’s chief military base in Syria, Khmeimim Air Base near Latakia (alternately Hmeimim), has come under sporadic waves of attack by small armed drones, which have appeared increasingly sophisticated. Those attacks were assumed to have been the work of jihadists operating out of Idlib, such as Jabhat Fatah al-Sham, who launched the small makeshift drones in an attempt to penetrate Russian defenses, even targeting the Russian naval facility at the Syrian port city of Tartus in addition. The Kremlin now says, based on new intelligence provided by the Russian defense ministry that a major attack on Khmeimim last January was coordinated by a US spy plane. 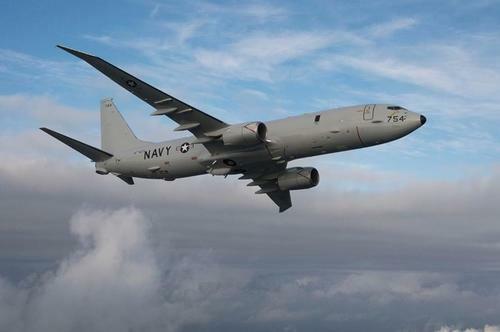 Kremlin spokesman Dmitry Peskov presented statements confirming Russian intelligence has produced “undoubtedly a very alarming report” which finds a US P-8 Poseidon surveillance plane was behind the nighttime January 8th attack which involved 13 unmanned aerial vehicles (UAVs) in total — 10 approached Khmeimim while 3 attempted an attack on the naval facility in Tartus. He said that the moment Russia switched on its electronic countermeasures, the drones switched to manual mode while still operating in a sophisticated and highly coordinated fashion. The deputy defense minister noted: “Manual guidance is carried out not by some villagers, but by the Poseidon-8, which has modern equipment. It undertook manual control,” he said. “When these 13 drones faced our electronic warfare screen, they moved away to some distance, received the corresponding orders and began to be operated out of space and receiving help in finding the so-called holes through which they started penetrating. Then they were destroyed,” Col. Fomin continued. Most of the drones during the January attack were intercepted by Russian air defense systems, but six drones were landed by Russian forces after successfully taking control through electronic countermeasures. At the time the Russian military published photographs of them and said they would be studied to attempt to find the source. 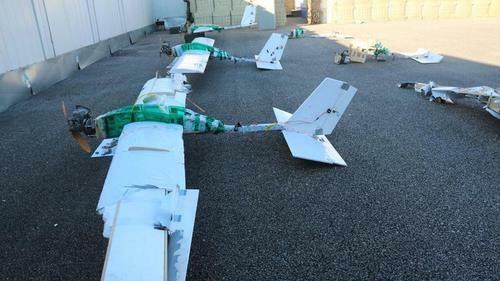 Further it marked the “first time that terrorists massively used unmanned combat aerial vehicles of an aircraft type that were launched from a distance of more than 50 kilometers, and operated using GPS satellite navigation coordinates,” the ministry had said in a statement. A prior New Year’s Eve attack had actually successfully damaged and disabled Russian jets parked at the base. A series of similar attacks — though nothing of the January attack’s scale and sophistication — occurred throughout the summer. After Thursday’s Russian defense ministry explosive charge that the US was behind attack, Russian media has suggested President Vladimir Putin will possibly broach the subject with President Trump.